The Cambro 12CW135 Camwear® full-size food pan has a uniform 1⁄2-inch flange that fits in prep table and food bar openings. Since the nonstick interior is smooth, it reduces waste and facilitates cleanup. It is made of polycarbonate, which resists bending, cracking, and denting. 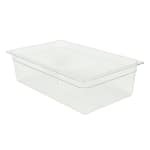 Product can be seen through the 203⁄5-quart pan’s clear construction. "I use this product to hold the many packages of frozen vegetables I buy and store in my freezer. The dimensions are perfect and it is nice not to..."
"I use this product to hold the many packages of frozen vegetables I buy and store in my freezer. The dimensions are perfect and it is nice not to have all sorts of frozen food bags falling out of my freezer every time I open the freezer door. I am fortunate to have found exactly what I need in this food pan!"